Stanford's Bradley Klahn and Georgia's Chelsey Gullickson both experienced midseason slumps. But now that the sophomores have put their names on the list of NCAA singles champions, their second collegiate seasons ended with resounding success. Klahn defeated Austen Childs of Louisville 6-1, 6-2, while Gullickson battled to a 6-3, 7-6(7) decision over Cal-Berkeley's Jana Jurikova on a damp and humid afternoon at the Dan Magill Tennis Complex at the University of Georgia. Early morning drizzle gave way to a late morning shower, but despite frequent rumbles of thunder and an occasional fat drop of rain, there was a four-hour window of dry weather that allowed the uninterrupted completion of all four finals. Klahn, a 9 seed, had taken control of his match with the unseeded Childs early, breaking him in the fourth game and again in the sixth. 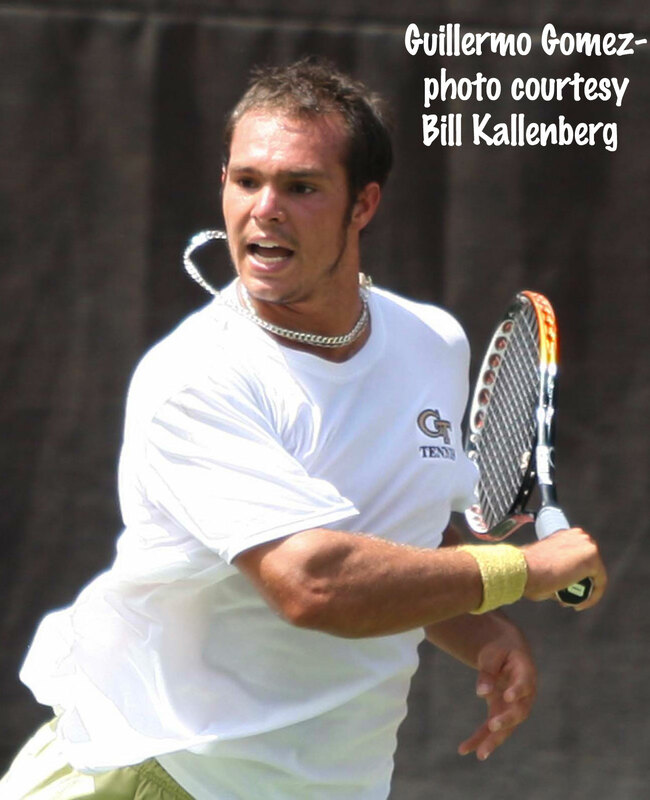 Using his forehand to keep Childs on the defensive, Klahn didn't let the occasion disrupt his focus, thanks to some advice from his coach John Whitlinger, a Stanford NCAA singles champion in 1974. "About an hour and a half before the match, I pulled him aside and said, I've been through this," Whitlinger said. "The biggest thing is that you've got to stay in the moment. When I played it, Chico Hagey killed me in the first set and I didn't let it bother me. We played three out of five then and I won the next three sets. Don't think about what's in the past, or what's potentially in the future, just stay in the moment and play each point." After Klahn broke Childs in a nine-deuce game to open the second set, the temptation to start thinking about joining the 13 other NCAA singles champions from Stanford must have been great. But Klahn didn't succumb. "Having coach talk to me before calmed my nerves a bit," said Klahn. "I had a million thoughts racing through my head when we were coming to the site today. I thought I did a good job of not getting caught up in what was at stake, taking it point by point. That's the only way to go. If you start thinking about what if, you make it a bigger deal than it is." Back in February, Klahn had lost three of four matches, but said the Cardinal's goal is always to peak in May. After a couple of close three-setters in the second and fourth rounds, the Poway, California native saw it all come together in the final two matches, beating top seed Henrique Cunha of Duke Sunday and Childs in the final, losing only seven games total. "I started playing a little bit better each round and by the semis and finals, I really thought I found my game," Klahn said. "I couldn't keep it away from his forehand, and he was just cracking winners from everywhere," said Childs, a junior from New Zealand. "I was trying to get to his backhand and then go to his forehand, but his forehand was big today." "In the second set I tried to slow it down, make a few more balls, and he was missing a few more forehands than usual," Childs said. "I had a few chances, I could've gotten a few more games if I had gotten that last point, but credit to him, he just came up with some big shots." With Stanford hosting the NCAA tournament next year, Klahn is planning to return for his junior year, with his eye on the team championship. He also hopes to receive a U.S. Open main draw wild card, as Devin Britton did after winning the 2009 title in College Station. "If that happens, that would be a great honor for me," said Klahn. "But that's up to them. I just want to have a good summer, keep working hard and doing the best that I can. My main goal is to enjoy myself and to keep working on my game. I still have things I can work on." "I would be disappointed if he didn't get a wild card into the U.S. Open. He deserves it. It's their decision, but I think he has every right to be in there, and I hope he does." Also in line for a main draw wild card is Georgia's Gullickson, who won a tight battle of big hitters in the women's final. Second in the fall preseason rankings, Gullickson, a semifinalist at the 2009 NCAAs, had fallen out of the top ten. Ranked 12th coming into the NCAAs, the No. 9 seed played her best tennis of the season in front of her home crowd, winning every match in straight sets. Included in her run were wins over the No. 8, No. 1, No. 4 and No. 2 seeds. "I really don't know what it was that turned the light switch on for me," said Gullickson, from Palm Beach Gardens, Fla. "I think as the tournament went on the one thing that did improve was my serve. And the crowd was awesome here. I just felt more confident in my shots and in my returns, and I was playing a lot smarter on the court, not going for too much. And I was staying positive. Earlier in the season, I would get really down on myself and it would just kind of take over the whole match." Gullickson avoided any negativity down 3-0 in the second set to Juricova, a sophomore from Slovakia. After taking the first set with breaks in the sixth and eighth games, Gullickson had a 40-0 lead serving at 0-1 in the second set. Juricova came back to get the break, and with a hold in the next game took a 3-0 lead. Gullickson got the break back, but stumbled in her next service game. Juricova couldn't hold that lead either, and Gullickson began to win more points with her serve, as the set moved into a tiebreaker. At 4-4 in the tiebreaker, Juricova made a forehand error and a big serve from Gullickson gave her a 6-4 lead and two match points. As the crowd of several hundred groaned, she lost the first on a net cord, and the second to a Juricova winner. Gullickson's forehand, a weapon throughout the day, gave her another match point, her third, at 7-6, but a Juricova backhand winner saved that. Another Gullickson forehand winner made it 8-7, and match point No. 4. A good serve by Juricova had Gullickson on the defensive, but Juricova's swinging volley found the tape, giving Gullickson the title. "I still can't believe it," Gullickson said. "When she hit that swinging volley into the net, I just kind of sat there, thinking oh my gosh is this really happening," Gullickson said. "I'm so excited. I struggled a lot this year, but it paid off right now. It just feels amazing. It's something that I can't explain." Juricova blamed her serve, not the vocal Georgia Bulldog fans, for her loss. Asked about playing against a local favorite, Juricova said she enjoyed it. "It helped me a lot when they got louder," Juricova said. "I was taking it as a challenge. It helped me try harder, I would say." As for her serving woes, Juricova said that stroke had been an issue throughout the tournament. "I was kind of up and down on the serve," Juricova said. "I had my chances, and I just didn't take them. But I know what I need to work on now." Gullickson, who joins Lisa Spain (1984) and Angela Lettiere (1994) as Georgia NCAA singles champions, is planning on returning to school in the fall. "I love Athens, I love Georgia and I haven't even thought about what's going to happen after winning NCAAs," said Gullickson. "I'm going to train this summer, try to play some tournaments, hopefully if I could get the wild card into the US Open, do that, but as of right now, I'm staying in school." In the doubles finals, the 2009 finalists batted .500, with No. 2 seeds Lindsay Burdette and Hilary Barte of Stanford taking the women's title with a 7-5, 4-6, 6-0 victory over top seeds Natalie Pluskota and Caitlin Whoriskey of Tennessee, while Tennessee's Davey Sandgren and JP Smith were again bested by Michael Shabaz of Virginia, who this year teamed with Drew Courtney for a second consecutive NCAA title, 6-7(4), 6-2, 6-3. Losing to Juricova and partner Mari Andersson of Cal-Berkeley in last year's finals, Barte said the win this year was "sweeter" after the bitterness of that defeat. Burdette was more philosophical about the outcome of the championship match last year. "I don't look at it as a lost opportunity in any way last year," said the senior. "It was just part of us growing as a team. We had to go through that; it was just another step along the way." With the women's team title, the men's singles title and the women's doubles title, Stanford took three of the five championships in Athens, and Burdette reflected on the significance of that accomplishment. "I think it speaks for itself in a lot of ways," Burdette said. "But most of all I think it just goes to show that it's really, really tough to be dominant all the time. I think the fact we haven't been as dominant in the past couples years speaks to how hard the past few teams that were so dominant worked, all that it took to make them the best year after year." The Virginia men are in the midst of some dynasty building of their own, with Shabaz and Courtney capturing the Cavaliers' fourth straight individual title, again at the expense of Sandgren and Smith, seeded second this year. Smith was on the losing end in the second of Somdev Devvarman's two NCAA singles titles in 2008, and last year he and Sandgren lost to Shabaz and Dom Inglot in the championship match, also in three sets, after winning the first. Shabaz was serving for the first set at 5-4, when he double faulted three times to give the break back. But in the final two sets, Courtney and Shabaz raised their level. "It was kind of a similar situation last year," said Shabaz, the first player to win back-to-back NCAA men's doubles titles since Cal's Matt Lucena in 1990 and 1991. "The only difference was last year they flat out beat us in the first set. This time, I personally gave it to them a little bit, but I knew we could come back, and I felt like we were playing good doubles." With both doubles teams exclusively Americans, there is also a chance the USTA will invite them to compete in the US Open main draw in late August. The 2011 combined men's and women's NCAA Division I championships will be at Stanford University May 19th through May 30th. Two nineteen-year-old sophomores from storied tennis programs earned an opportunity to add to their school's legacies Sunday with semifinal victories in the NCAA individual championships. Under a continously threatening sky, Bradley Klahn of Stanford defeated top seed Henrique Cunha of Duke 6-2, 6-2 to reach the men's championship match, while Chelsey Gullickson of Georgia downed No. 4 seed Hilary Barte of Stanford 7-6(6), 6-3 to take her place in title match. Gullickson, a 9 seed, fell behind 4-1 in the opening set, with a 17 minute rain delay disrupting the match in the second game. She got the break back in the seventh game, continuing to hit her potent ground strokes against the ultra quick Stanford junior. After another very brief rain delay at 5-5, Barte held at love, and Gullickson faced a set point serving at 5-6. A good serve kept her in the game, and once Gullickson took the next two points, play was again suspended, thankfully for the last time, as the players approached a tiebreaker. Again facing a set point down 5-6 in the tiebreaker, Gullickson was fortunate to see Barte make first a forehand error, then a backhand error, to give Gullickson her first set point. A good first serve was all the sophomore from Florida needed to finish the set, and the hundred or so Bulldog fans in attendance erupted in applause. Gullickson took a 2-0 lead in the second set, but it didn't last, with Barte breaking back in the third game. Gullickson kept the pressure on however, blasting her forehand and backhand on cue and took a 4-2 lead in the final set. Barte couldn't find a way to win points when she needed them, and Gullickson served out the match with a minimum of drama, becoming the fourth Georgia woman to reach the NCAA singles final. "I thought I did a good job, especially in the first set, of keeping her off balance," Barte said. "But in the second, she was just too good." Gullickson, who had reached the NCAA semifinals last year in College Station as a freshman, gave the hometown support credit for her win. "I wouldn't have been able to do it without the crowd," said Gullickson, who admitted that last year's semifinal loss to Miami's Laura Vallverdu was on her mind. "The crowd here is awesome, our fans are the best, so I'm so excited for tomorrow." 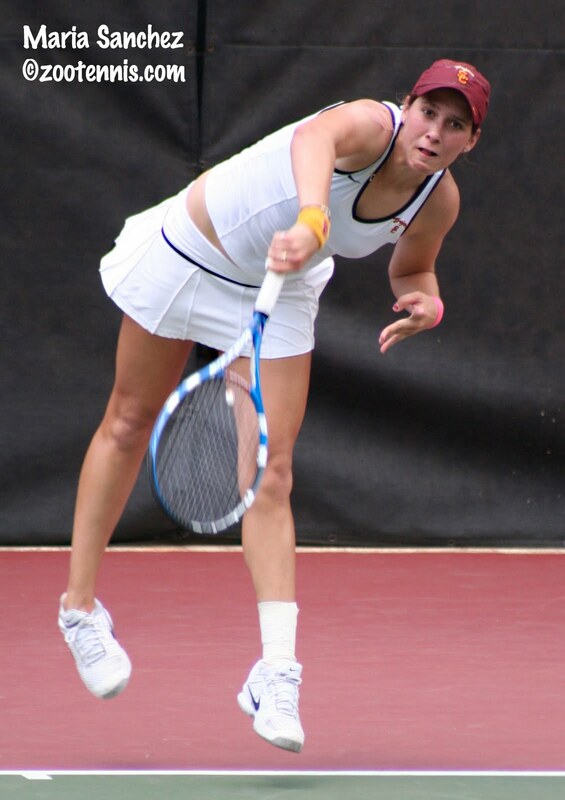 While Gullickson hopes to join Lisa Spain (1984) and Angela Lettiere (1994) as NCAA singles champions, her opponent, Jana Juricova of California-Berkeley has a more recent role model. After a 7-6(6), 6-2 win over Vallverdu Sunday, Juricova is hoping to join emulate Bear Suzi Babos, who won the title in 2006. "When I got to Cal she had already graduated," said the sophomore from Slovakia, the No. 2 seed. "But she stayed on one semester, so I got to hit with her a few times in practice. When I came, she was my role model, a great player, so I would love to repeat it." Juricova, the reigning ITA Indoor champion, struggled with her serve in the opening set, and failed to convert on two set points with the eighth-seeded Vallverdu serving at 5-6 in the first. In the subsequent tiebreaker, Vallverdu had a set point at 6-5, but Juricova got her out of position and put away a forehand. Two errors by the Miami senior ended the set, and Vallverdu was unable to counter the more relaxed Juricova, who easily held serve throughout the final set. "In the first set she was serving really well and that made it like even harder for me," Juricova said. "But then I calmed down a lot in the second set and it helped my serve too." Gullickson has won both matches she and Juricova have played. In last year's NCAA round of 16, Gullickson took a 6-3,7-6(5) decision, and in the fall's at ITA Riviera All-American, Gullickson won another close one, 7-6(3), 7-5, in the semifinals. In Klahn's victory over Cunha, it was left-hander against left-hander, with the sophomore from San Diego rolling past the freshman from Brazil. Klahn, who had gotten off to a slow start in two of his matches this past week, knew he had to be sharp from the start against Cunha, and he was. Serving well and making almost no unforced errors, Klahn broke Cunha in the fifth game of the first set and again in the seventh. "I got off to a real good start, a lot better than the past few matches," Klahn said. "I knew I couldn't spot him an earlier set, he's a great player. I knew I had to get on him quickly, take it to him, play aggressively, dictate the points and get him out of his rhythm." Cunha, who had not lost a set in his previous four victories, made many more unforced errors than he had in those matches and struggled to hit winners, a problem he didn't have against his previous opponents. There was a glimmer of hope for him when the rain came with Klahn serving at 4-1, 40-30, but even that ten minute break couldn't stall Klahn's momentum. He won that game and his next service game to secure his place in the final. Klahn hopes to join the 13 other NCAA men's singles champions from Stanford, a group that includes his current coach John Whitlinger, who won the title in 1974. "It's definitely crossed my mind," Klahn said of joining a list that includes John McEnroe and Bob Bryan. "But I can't look at like that. It's another tennis match and I have to go out and execute my game plan and not get to caught up in what's at stake." 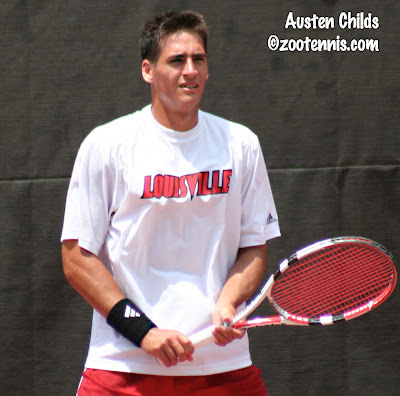 Klahn will be facing unseeded Austin Childs of Louisville in the championship match, after Childs followed the pattern of the day by winning the first set in a tiebreaker and taking control in second in a 7-6(2), 6-0 victory over Tim Puetz of Auburn, a 9 seed. Childs fought off countless break points in the first set, then raised his game in the tiebreaker. His one-handed backhand began to heat up, and Puetz began to chip in with errors. Serving to open the second set, Childs again had to fight off three break points, and when he couldn't convert those, Puetz seemed disheartened. Broken for the first time in the next game, Puetz, a junior from Germany, began going for more and more and the inevitable errors began to pile up. Childs, a junior from New Zealand, had several dozen vocal Cardinals fans, members of the soccer, tennis and swim teams, to help him get through the frequent tight spots he found himself in. "They drove last night for about eight hours, got here like three in the morning," Childs said. "They said they were going to be as loud as they can." Childs is the only Louisville player to ever reach an NCAA final, and his coach Rex Ecarma admitted that he wasn't expecting this run. "He lost in the first round in straight sets the last two years," Ecarma said. "So I think he'll forgive me for not having too many sets of clothes right now. I'm just trying to figure out what I'm going to wear tomorrow." Klahn and Childs will be meeting for the first time in Monday's final. While all four singles finalists are in an NCAA singles final for the first time, the doubles finals will feature no less than five repeat competitors. 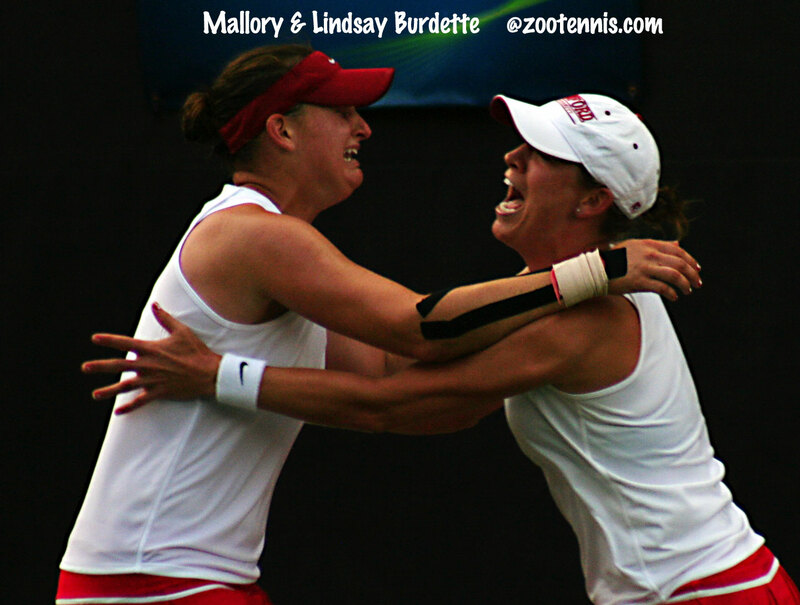 Stanford's Barte and Lindsay Burdette, who lost in the 2007 doubles final to Juricova and Mari Andersson of Cal, are hoping to capture the winners' trophy this time. Barte and Burdette, the No. 2 seeds, blazed past No. 4 seeds Andrea Remynse and Yasmin Schnack of UCLA 6-0, 6-1. Their opponents in the final are top seeds Natalie Pluskota and Caitlin Whoriskey of Tennessee, who had a much more difficult semifinal against Gullickson and Nadja Gilchrist of Georgia, a 5 seeded team. After a 6-1 first set for Tennessee that took much longer to play than that score would indicate, the teams battled to a second set tiebreaker, which ended with Tennessee winning it 13-11. Georgia had six set points and served for the set twice; Tennessee needed six match points to finish the match. Stanford and Tennessee played for the Indoor title in November, and the Cardinal saved a match point in their 4-6, 6-3, 7-6(4) victory. Three of the four participants in this year's men's doubles final were on the court in College Station for the championship match last year. Tennessee's Davey Sandgren and JP Smith lost to Virginia's Michael Shabaz and Dom Inglot 3-6, 7-6(4), 6-4 in last year's title match. This year the Volunteer pair will meet Shabaz and Drew Courtney for the championship. Seeded No. 2, Sandgren and Smith struggled in their first round match, but found their form along the way. In Sunday's 6-3, 6-2 victory over the unseeded team from North Carolina, Stefan Hardy and Clay Donato, the pair looked very sharp. Shabaz and Courtney, unseeded this year as Shabaz and Inglot were last year, took out No. 4 seeds Klahn and Ryan Thacher of Stanford 7-6(3), 7-6(7). Klahn was broken in the opening game of the match and Shabaz in the sixth game, but there were no breaks after that. Stanford fought off a match point at 5-6 in the second set and had two set points at 6-4 in the second set tiebreaker, but Thacher missed a volley on the first and Shabaz saved the second with a big serve that produced an easy putaway for Courtney. Virginia's second match point at 7-6 was brushed aside by a Thacher overhead, but they got a third on the next point when Shabaz ended a long exchange of shots with a forehand winner in the alley. Klahn couldn't handle Courtney's serve on the next point, and Virginia was on to the final, the fifth consecutive year the Cavaliers have had a finalist in the NCAA individual championships, a modern championship (post-1976) record. The doubles finals are scheduled for noon on Monday, with the singles finals slated for 2 p.m. I usually have a few days between the end of the NCAAs and the start of the French Open juniors, but this year there is an overlap. Before the start of today's individual semifinals in singles and doubles at the NCAA, I wanted to do a brief report of the first day of the French Open juniors, but I had no thought that it would contain this much news. Just a few moments ago, Junior Ore of the U.S. defeated top seed and defending champion Daniel Berta of Sweden 2-6, 6-1, 6-4 to record the biggest win of his career. Ore, who trains at the Junior Tennis Champions Center in College Park, Md., is one of three U.S. boys to win their opening matches. No. 13 seed Mitchell Frank and lucky loser Dane Webb advanced, while Raymond Sarmiento lost in the opening round. No. 6 seed Denis Kudla is still on court, as is Andrea Collarini, while Nick Chappell is not playing today. The top seed in the girls draw, Monica Puig, won her opener, as did qualifier Grace Min, who beat Canadian Eugenie Bouchard. They play each other in the second round. No. 10 seed Lauren Davis and Ester Goldfeld play later today, while No. 9 seed Beatrice Capra and Sloane Stephens are not on Sunday's schedule. See the rolandgarros.com for the results and draws and live scoring. The Wimbledon acceptances are out and can be found at the ITF junior website. As of now, Christina McHale is scheduled to compete, as is Yuki Bhambri, who hasn't played a junior tournament since last year's U.S. Open. Two matches that were expected to highlight Saturday's quarterfinal singles action at the Dan Magill Tennis Complex didn't play out as anticipated. Top seed Henrique Cunha of Duke and Robert Farah of USC, a No. 9 seed, had played less than four games when the Trojan senior rolled an ankle, and two games later he retired at 4-1 in the first set. Georgia's Chelsey Gullickson, spurred on by an enthusiastic holiday weekend crowd, powered past top seed Irina Falconi of Georgia Tech 6-2, 6-4 to reach the NCAA semifinals for the second consecutive year. Against Cunha, Farah had recovered from a 15-40 deficit by hitting three straight aces serving at 1-2 in the first, but on the ad point, Farah was sent deep into the backhand corner by a Cunha shot and his ankle gave way. He let out a loud and frustrated groan, and after a few minutes of attention by the USC trainer, hopped back to the bench for a medical timeout. Farah returned to play, and actually hit one winner in that fourth game, but his movement was severely hampered, and after dropping the fourth game, and failing to win a point on Cunha's serve in the next game, he retired. 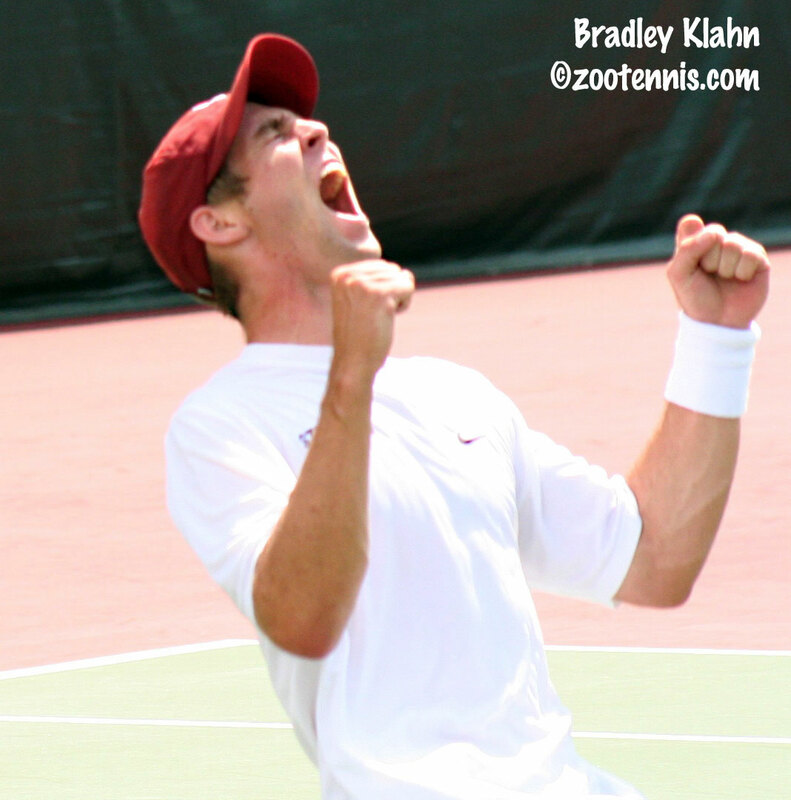 It was an unfortunate ending to his illustrious career at USC, in which he won an NCAA doubles title in 2008 and team titles in 2009 and this year. Cunha was a bit shaken by the sudden end to the match. "I'm very sorry for Farah," said Cunha, a freshman from Brazil. "He's a great player and I knew it was going to be a very, very hard match. I'm kind of sad now, because it's not the way I wanted to win, but it happens, and I'm thinking only about tomorrow now." Gullickson, a 9 seed, was playing on the court next to Farah and Cunha, but she didn't let the sudden end of the men's quarterfinal affect her razor sharp game. Hitting winners with abandon, Gullickson put Falconi on the defensive from the outset, keeping the Georgia Tech sophomore from using her usually effective net game. After the quick first set, Falconi began to adjust and took a 4-2 lead in the final set, getting a few unforced errors from Gullickson. But Falconi lost her serve at love and after Gullickson held, Falconi was broken again, giving Gullickson the chance to serve for the match. At 40-30, Falconi saved one match point with a confident forehand volley winner and got a break point when her return of Gullickson's next serve handcuffed the Georgia sophomore. But Gullickson blasted a backhand winner for deuce, hit a big overhead for match point No. 2, and another clean backhand winner emphatically ended the match. Gullickson was 0-2 against Falconi this season, losing to her in the final of the ITA Riviera All-American last fall 6-2, 6-1, and in the dual match in March 7-5, 6-0, but she wasn't troubled by those defeats. "In those matches, I didn't really play that well, I wasn't consistent," said Gullickson. "But the past two matches I've played in this tournament, I've felt super confident. The crowd helped me a ton today, and I just felt good. I kind of struggled a little bit this season, but without making the team (tournament), I've had a good two and a half weeks to train. I've been doing two-a-days, and I felt that really paid off. I feel really in shape on the court, really consistent and really confident. Each match is getting better and better." Next up for Gullickson is Stanford's Hilary Barte, the No. 4 seed, whom she has never played. Barte managed to defeat unseeded Bianca Eichkorn of Miami 6-4, 6-4, but despite the rather routine score, it took over two hours for the Cardinal junior to post the victory. 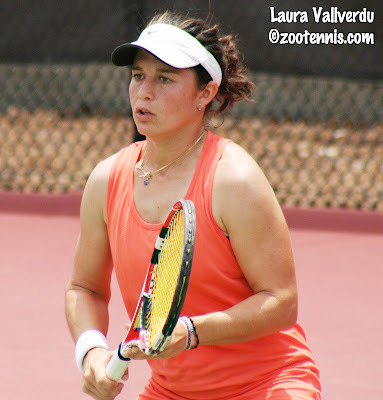 On the other side of the draw, 2009 finalist Laura Vallverdu of Miami, the No. 8 seed, rolled past No. 3 seed Maria Sanchez of Southern California 6-3, 6-0. The feisty Vallverdu frustrated the much bigger Sanchez, using her speed and her court sense to take Sanchez out of her comfort level. Vallverdu will again face a bigger and stronger opponent in the semifinal, where she will meet No. 2 seed Jana Juricova of California-Berkeley, a six-footer. Juricova, the ITA Indoor Champion, came from behind to top unseeded Nina Secerbegovic of Baylor 2-6, 6-2, 6-2. Cunha's opponent in the semifinals is Stanford sophomore Bradley Klahn, the lone U.S. player remaining in men's singles. Klahn, a 9 seed, lost the first set to unseeded Marcel Thiemann of Ole Miss, but battled back for a 1-6, 7-6(4), 6-4 victory. Although Klahn had to win the second set tiebreaker to keep the match going, he didn't feel particularly nervous at that juncture of the match. "I knew I could get myself going as the second set went on," Klahn said. "Just staying positive is the main thing, making him hit a few more balls, hopefully generating a few more errors, which he gave me a little bit in the second and third sets." The other men's semifinal features Auburn's Tim Puetz, a 9 seed, against unseeded Austen Childs of Louisville. Puetz downed Michael Shabaz of Virginia, also a 9 seed, 6-4, 6-2, while Childs surprised Texas's Dimitar Kutrovsky, a 9 seed, 6-4, 5-7, 6-3. Childs, a junior from New Zealand, became the first player from Louisville to reach the NCAA quarterfinals with a win over Denes Lukacs of Baylor on Friday, so he is blazing a new trail for the team with every win. "It just shows how good Rex Ecarama is," said Childs. "He's a really good coach. His game plans are unbelievable." Childs said he was instructed to keep Kutrovsky off the baseline. "He likes to take it early and come in a bit," Childs said of the Longhorn senior. "I needed to serve big, make a lot of balls and make it tough for him. And I did it near the end. He started coming up with some good points, but I did it in the third." The doubles quarterfinals were full of drama, with several of the singles Final Four also reaching that stage in the doubles. Gullickson and her partner Nadja Gilchrist put an emphatic end to the 27-match winning streak of Notre Dame's Kristy Frilling and Kali Krisik, the No. 3 seeds, taking a 6-2, 6-1 win that was interrupted by an hour rain delay as a thundershower moved over the Dan Magill Tennis Complex. The No. 5 seeded Georgia pair will meet top seeds Natalie Pluskota and Caitlyn Whoriskey of Tennessee, who survived Florida's Marrit Boonstra and Allie Will, a No. 5 seeded team, 2-6, 7-5, 7-6(6). Leading 4-1 in the final set tiebreaker with Whoriskey serving, the next six points went to the receiving team. Boonstra and Will saved three match points to make it 6-6, but two errors by the Gators put the Tennessee pair back in the semifinals, as they were in 2009. 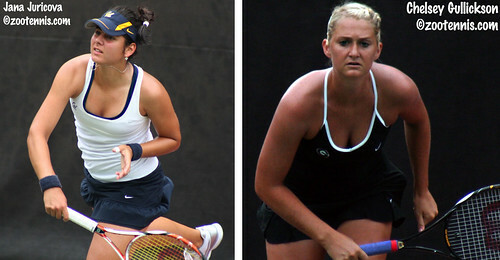 The other half of the women's doubles draw will be a Pac-10 rematch, with UCLA's No. 4 seeded team of Yasmin Schnack and Andrea Remynse facing Stanford's Barte and Lindsay Burdette, the No. 2 seeds. Schnack and Remynse defeated Miami's Vallverdu and Gabriela Mejia, who came from two breaks down in the first set to force a tiebreaker, but came up just short, eventually falling 7-6(9), 6-2. Barte and Burdette downed Baylor's Lenka Broosova and Csilla Borsanyi 6-4, 6-4. In the men's doubles, top seeds Cunha and Reid Carleton of Duke were defeated by Virginia's Drew Courtney and Shabaz, who are unseeded, 6-4, 6-7(6), 6-3. 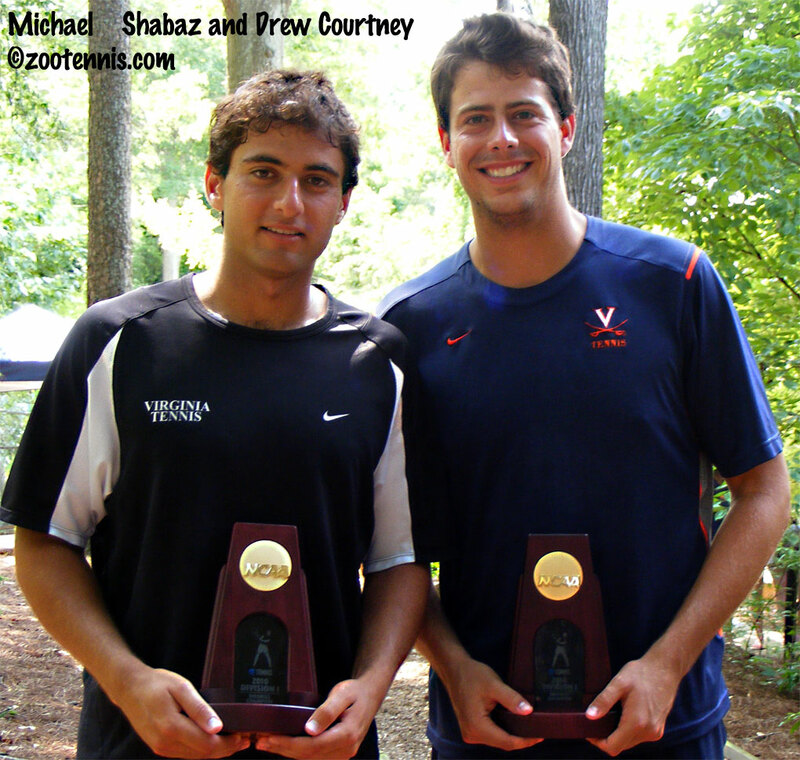 Shabaz is the defending NCAA doubles champion, winning the 2009 title with the now graduated Dom Inglot. The Virginia pair had a 6-4 lead in the second set tiebreaker, but Duke won the set's last four points. Virginia didn't panic however, and built a 5-1 lead in the third set before Shabaz served it out. They will meet Stanford's Klahn and Ryan Thacher, the No. 4 seeds, who fought back from two breaks down in the second set to take a straight set decision from Oklahoma's Andrei Daescu and Costin Paval, 6-2, 7-6(9). The other semifinal will feature No. 2 seeds and 2009 finalists Davey Sandgren and JP Smith of Tennessee against the unseeded North Carolina team of Clay Donato and Stefan Hardy. Sandgren and Smith outlasted Wake Forest's Steve Forman and Iain Atkinson 7-6(4), 5-7, 6-3, while Donato and Hardy dismissed Kentucky's Brad Cox and Eric Quigley 6-3, 6-1. Semifinal action starts at noon on Sunday. #2 Henrique Cunha (1), DUKE def. 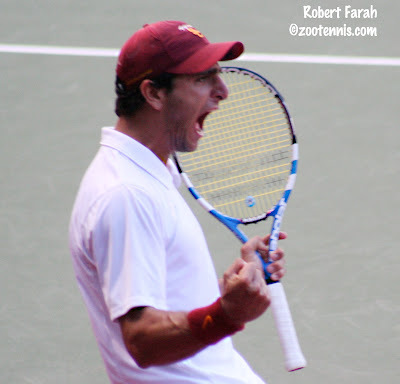 #9 Robert Farah (9-16), USC, 4-1, ret. inj. It was another hot day in Athens, with temperatures in the low 90s, but even those players from more temperate locations had time to get used to the heat and humidity nine days into the tournament. 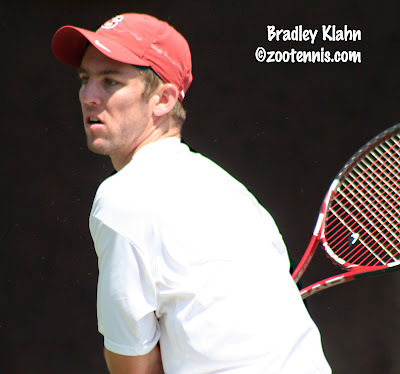 One of them, Stanford sophomore Bradley Klahn, a 9th seed, defeated No. 4 seed Guillermo Gomez of Georgia Tech 6-4, 6-4 in Friday's third round. "We've been here for ten days so I'm definitely acclimated by now," Klahn said. "I feel pretty good, and I'm sure it can be a lot worse this time of year here." Klahn got late breaks in both sets, the only breaks of the match, and in the first set break, Gomez was up 40-0 in that ninth game. "I hung around, I hadn't been winning many points on his serve," Klahn said. "I just tried to get one at a time and he gave me a few errors and I got the break. In the second set, I had a lot more chances to break, at 1-all and 2-all and couldn't convert. He came up with some big shots, good serves, but at 4-all he made some errors." After the break, Klahn was serving for the match, it was that shot that was the difference. At 5-4 30-30, Klahn hit two first-serve winners to close out the 2009 ITA Indoor finalist. Klahn will play unseeded Marcel Thiemann of Ole Miss, who won his second consecutive three-hour match, defeating Eric Quigley of Kentucky, a 9 seed, 7-6(4), 3-6, 6-2. Although Quigley lost, 9-16 seeds abound in the quarterfinals, with a total of 5. Two will play each other in Saturday's quarterfinal: Michael Shabaz of Virginia and Tim Puetz of Auburn. Shabaz defeated No. 7 seed Chase Buchanan of Ohio State 6-2, 7-6(3), and Puetz downed unseeded Rhyne Williams of Tennessee 7-5, 7-6(4). Dimitar Kutrovsky of Texas, another 9 seed, survived a lengthy battle with unseeded Bassam Beidas of Pepperdine, recording a 6-7(6), 6-1, 6-2 victory to set up a meeting with unseeded Austen Childs of Louisville. Childs defeated No. 9 seed Denes Lukacs of Baylor 6-4, 6-4. The marquee match on Saturday will be Southern California's Robert Farah, a 9 seed, against top seed Henrique Cunha of Duke. Farah breezed past No. 6 seed Oleksandr Nedovyesov of Oklahoma State 6-0, 6-3, while Cunha downed Sanam Singh, a semifinalist in last year's NCAAs and a 9 seed, 6-3, 7-6(6). Cunha, a slight left-hander, hits the ball as cleanly as anyone, and makes very few errors, while Farah is much more physically imposing and has a big serve that can get him out of tight spots. It promises to be an interesting contrast of styles that should produce some amazing points if both players continue to perform at the top of their games. The 1 vs. 9 matchup in the women's draw is a good one too, with top seed Irina Falconi of Georgia Tech facing Chelsey Gullickson of Georgia. Falconi earned her spot in the quarterfinals with a 6-1, 6-4 win over No. 9 seed Venise Chan of Washington, with Falconi coming from behind to win the final five games of the match. Gullickson eliminated No. 7 seed Allie Will of Florida 6-1, 6-4. After a two-tiebreak victory over Will at the Riviera All-American last fall, Gullickson was prepared for a close match. "I knew she was going to get a lot of balls back and fight really hard," Gullickson said. "I love playing her because she gives me a great match, but I knew coming out if I made a lot balls and stayed consistent, I could stay positive." Gullickson's serve was also a factor in her ability to keep Will under pressure, and she gave credit to her patience as well. "I wasn't going for the wrong shots at the wrong time," said Gullickson, a sophomore. "I been working on trying to be really smart on the court. When I have the shot I'm going to go for it, but I'm trying not to go for things too early; make the points longer." Gullickson's team did not make it to the Sweet Sixteen, so she has not been through the grind of the team tournament, but No. 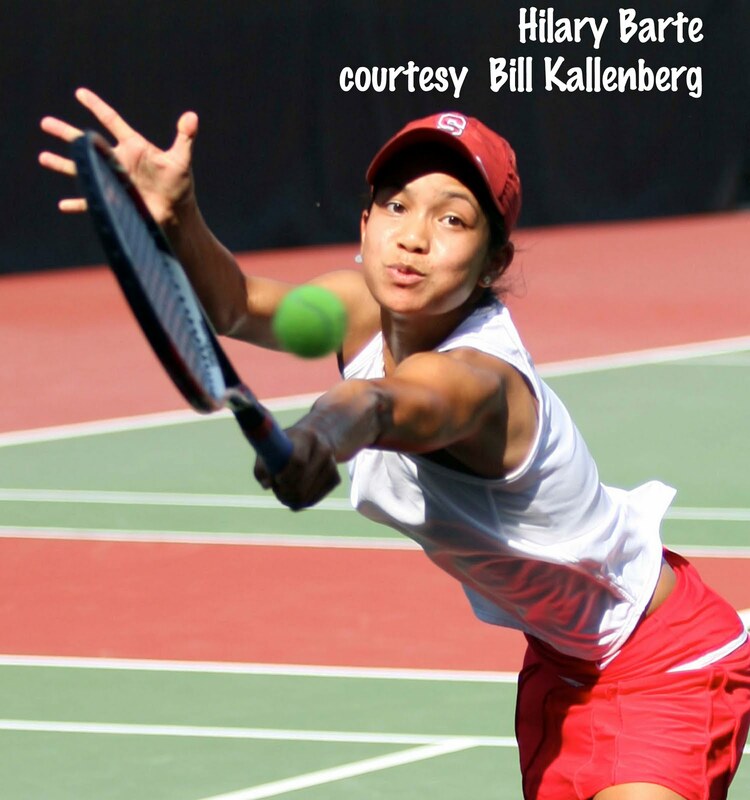 4 seed Hilary Barte of champion Stanford actually thinks she had an advantage. "I think playing so long in the team event actually helps," said Barte, who defeated Kristi Boxx of Ole Miss 6-3, 6-2. "You just kind of get in a rhythm of playing every day, so I have an edge." Barte will meet unseeded Bianca Eichkorn of Miami in the quarterfinals. Eichkorn downed No. 5 seed Lenka Broosova of Baylor 6-4, 7-6(3). Baylor is not without a quarterfinalist however, as unseeded Nina Secerbegovic, who plays No. 2 for the Bears, advanced with a 3-6, 6-0, 6-1 victory over unseeded Ellah Nze of Duke. Secerbegovic will face No. 2 seed Jana Juricova of Cal, who defeated No. 9 seed Maria Mosolova of Northwestern 6-3, 7-6(8). It's a rare college tournament that sees the top four seeds reach the quarterfinals, but it has happened here in Athens on the women's side. No. 3 seed Maria Sanchez completed that feat when she downed unseeded Noelle Hickey of UCLA 6-4, 7-6(1). Next for Sanchez is Miami's Laura Vallverdu, the 2009 NCAA singles runner-up. The eighth-seeded Vallverdu beat Caitlin Whoriskey of Tennessee, a 9 seed, 6-2, 6-2. The doubles competition Friday afternoon was filled with three-setters. Women's top seeds Natalie Pluskota and Whoriskey of Tennessee had a straightforward 6-3, 6-1 win over Anna Redecsi and Selma Salkovic of DePaul, and No. 2 seeds Lindsay Burdette and Barte of Stanford also looked strong in a 6-3, 6-2 win over Alexa Guarachi and Courtney McLane of Alabama. But No. 3 seeds Kristy Frilling and Kali Krisik of Notre Dame needed a comeback to post a 2-6, 6-1, 6-1 victory over Kayle Duncan and Katarina Tuchimaa of TCU, as did No. 4 seeds Andrea Remynse and Yasmin Schnack of UCLA, who got past Hilary Bartlett and Taylor Marable of Princeton 3-6, 6-3, 7-5. The men's top team, Duke's Cunha and Reid Carleton, pulled out a 6-3, 3-6, 6-4 win over Amit Inbar and Nick Meister fo UCLA in match featuring high quality tennis and entertainment. No. 2 seeds JP Smith and Davey Sandgren of Tennessee, finalists in 2009, moved a step closer to repeating that achievement with a 6-3, 7-6(4) win over Oklahoma State's Nedovyesov and Aleksey Bessonov. 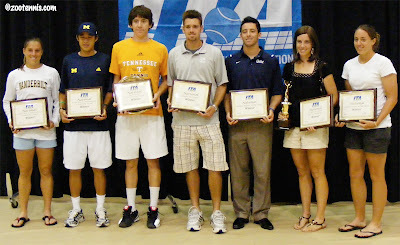 The triple crown of the NCAAs--team, singles and doubles championships, will not be won this year, as No. 3 seeds Steve Johnson and Farah lost to Clay Donato and Stefan Hardy of North Carolina 2-6, 6-4, 6-1. Leading 2-0 in the third set, Donato saved three break points in the third game and when Farah was broken in the next game to make it 4-0, even a brief rain delay couldn't disrupt the Tar Heels momentum. The No. 4 seeded team of Klahn and Ryan Thacher advanced to the quarterfinals with a 6-4, 3-6, 6-3 victory over Jason Jung and Evan King of Michigan. The singles quarterfinals begin Saturday at noon, with doubles to follow. For the specific times see the brackets at ncaa.com. It started hot and stayed hot Thursday in Athens, and with humidity high and little breeze, it was not a day any player in the second round of the NCAA individual championships wanted to be entangled in a three-hour match. Most of the favorites survived the energy-sapping conditions, although few had easy matches. Top seeds Henrique Cunha of Duke and Irina Falconi of Georgia Tech kept their court time to a minimum, with Cunha looking very sharp in his 6-3, 6-2 win over Gonzalo Escobar of Texas Tech. Falconi was behind in both sets of her match against Northwestern's Samantha Murray but found her rhythm to record a 6-3, 6-4 win. No. 3 seed Maria Sanchez of Southern California had a long and difficult two-setter with 2008 NCAA semifinalist Fani Chifchieva of Auburn, but pulled out a 7-6(3), 7-5 win. Sanchez served for the first set at 5-4 but wasn't able to seize that opportunity. In the tiebreaker, she took advantage of some good serving, and in the second set, she was able to capitalize on her first match point with Chifchieva serving at 5-6. After the match, Sanchez said her main focus was "just not to get in my own way." Sanchez's counterpart for the Trojans on the men's side, Robert Farah, is also one of the favorites for the title, even though he is a 9 seed. Down a break early in the first set to Georgia's Javier Garrapiz, Farah came up with some big shots when Garrapiz served for the first set at 5-4, and rolled to a 7-5, 6-1 win. Although Garrapiz wasn't aware of it, Farah had vomited twice at the beginning that tenth game. "I felt better after that, but I couldn't drink water anymore," Farah said. He showed no signs of illness as the game progressed, winning the first three points and getting the break back on the game's fifth point. "I kind of broke down," said Garrapiz, who also gave Farah's serve credit, calling it a "joke." "He started playing better too, I was kind of tired too, I was feeling it in my legs and didn't get to the balls I got to in the first set." In another morning match, No. 7 seed Chase Buchanan of Ohio State defeated Ryan Lipman of Vanderbilt in a rematch of the 2009 Boys 18s final in Kalamazoo. Buchanan won that match in straight sets, but had more difficulty on Thursday, when he needed a late break in the third set to record a 6-3, 1-6, 6-4 win. Buchanan had been up 3-0 in the final set, but the sophomore struggled to hold serve the remainder of the way, although he wasn't broken until serving for the match at 5-3. Lipman held a game point serving at 4-5, but double faulted, and a return winner by Buchanan gave him his first match point. Lipman saved that one, but Buchanan hit a forehand winner to give himself another one, and a forehand error by Lipman cost the freshman the match, which was just under two and a half hours long. No. 8 seed Alexandre Lacroix of Florida spent over three hours on the court with Bassam Beidas of Pepperdine, but was unable to record the win. Serving for the match in the third set, Lacroix was broken at 5-4, and Beidas took the next two games too, posting a 4-6, 7-5, 7-5 victory. Beidas was one of nine players who earned All-American honors on Thursday. For those unseeded in the individual tournament, a win in the round of 32 is another way to secure that coveted title. The other eight are: Kristie Boxx of Ole Miss, Bianca Eichkorn of Miami, Nina Secergebovic of Baylor, Noelle Hickey of UCLA, Ellah Nze of Duke, Rhyne Williams of Tennessee, Austin Childs of Louisville and Marcel Thiemann of Ole Miss. The first round of doubles finished late Thursday evening, and two finalists from the 2009 championships barely survived. Defending women's champions Mari Andersson and Jana Juricova of Cal, who are unseeded this year, survived Florida's Anastasia Revzina and Lauren Embree 6-7(2), 7-5, 6-1, with Revzina and Embree serving for the match at 5-4 in the second set. Davey Sandgren and JP Smith of Tennessee, the 2009 finalists, dropped the first set to Keziel Juneau and Sebastien Vidal of William and Mary, but managed to eke out a 4-6, 7-5, 7-5 victory. After all the drama and excitement of Tuesday's team finals, the first day of the individual tournament takes some getting used to. The crowds are smaller and there are many more school logos in evidence, with some players competing on the Dan Magill Tennis Center Complex courts for the first time. The weather hasn't changed however. Seasonable temperatures in the mid 80s with a pleasant breeze and partly cloudy skies made standing in the shade on the upper McWhorter courts downright comfortable. Top seeds Irina Falconi of Georgia Tech and Henrique Cunha of Duke had no trouble in their opening matches, with Falconi downing Vanderbilt's Jackie Wu 6-4, 6-1, and Cunha eliminating Cal's Pedro Zerbini 6-3, 6-1. No. 5 seed Austin Krajicek of Texas A & M was the highest seed to fall in the matches completed by 6 p.m. Krajicek couldn't get anything going in his match with Marcel Thiemann of Ole Miss, losing 6-1, 6-4. No. 2 seed Steve Johnson of USC and No. 3 seed JP Smith of Tennessee were scheduled for the evening matches after competing in the team final, and I was unable to stay due to a commitment to attend the ITA Hall of Fame Induction ceremony. No. 4 seed Guillermo Gomez of Georgia Tech needed two and a half hours to subdue Mortiz Baumann of Wisconsin 7-5, 4-6, 6-4, but he wasn't surprised by the effort required, even though he had beaten Baumann twice this season, both outdoors and indoors. "I think of myself as more of an outdoor player and he as more of an indoor player, but the results are otherwise," Gomez said. "It's funny, but that's tennis. The first one was the All-Americans, outdoors, and that was a tough three-setter too. Indoors (at Yale), the result was a little bit easier." Gomez, a finalist at the National Indoor this year, didn't feel he had any difficulty with the mid-afternoon heat, saying he was actually pleased to be tested early in the tournament. "I'd rather go through the first round with a tough three-setter than with an easy match," he said. "I think this is going to help me to do well in this tournament." An interesting second round match on Thursday will be a replay of last year's Kalamazoo Boys 18s championship, with No. 7 seed Chase Buchanan of Ohio State facing Vanderbilt's Ryan Lipman. Buchanan defeated Jean Yves-Aubone of Florida State 6-4, 6-2, while Lipman beat Thibaut Charron of Virginia Commonwealth 4-6, 6-4, 3-0, ret. In the women's tournament, No. 6 seed Yasmin Schnack of UCLA was defeated by Baylor's Nina Secerbegovic 6-4, 6-3, and Washington's Denise Dy, a 9-16 seed, was upset by Pachittra Thongdach of Boise State 2-6, 6-1, 6-1. Another 9-16 seed, Anastasia Petukhova of Fresno State, fell to Micaela Hein of Arizona State 7-5, 6-0. Results for matches played on the McWhorter courts stay on the live stats page. Results from those that are played on the main six courts can be found on the brackets themselves. What a difference a year makes. Not in the outcome--the USC Trojans are again NCAA men's tennis champions after a 4-2 victory over Tennessee Tuesday night--but in their state of mind as the NCAA finals again approached. "Last year was something unbelievable," senior Robert Farah said of the title USC won in College Station, Texas. "This year, I don't know what happened, but I thought we were going to win the whole way. I really liked that feeling. I was out there and I really trusted that we could do this. Last year in my match against (Ohio State's Bryan) Koniecko, I was so nervous. This year I didn't have my best start, but it wasn't because I was nervous. I was completely relaxed out there, just playing another tennis match. And I think that really made a difference in our team and their team." "I completely agree," said head coach Peter Smith. "As the match went on, I was kind of going, this is the national championship, but it was just like, normal." The No. 5 Trojans knew they were on the road however, as it was Tennessee, the second seeds, who had the bulk of the fans in the Dan Magill Tennis Complex bleachers. A thousand or so made the trip south to Athens, wearing the distinctive neon orange and waving pompons, hoping to spur the Volunteers to their first national title after two previous appearances in the final. It started off well for Tennessee, as none of their three doubles teams lost their serves, getting 8-6 wins at No. 1 and No. 3 to take a 1-0 lead. But the singles were a different story, as Southern Cal claimed five of six first sets, with Farah coming from a break down at No. 1 to take a tiebreaker from JP Smith in their opening set. Tennessee's Tennys Sandgren was the only Volunteer to take a first set, twice coming from a break down against Daniel Nguyen at No. 4 and winning it in a tiebreaker. Steve Johnson brought Southern Cal even with a 6-3, 6-2 victory over Boris Conkic at No. 2, and the match stayed at 1-1 for a long time. Volunteer freshman Rhyne Williams earned a split with Jaak Poldma at No. 3, and he gave Tennessee a brief 2-1 lead with a 1-6, 6-2, 6-1 win. Farah countered almost immediately, beating Smith 7-6(3), 6-4 to make it 2-2, while Nguyen had earned a split with Sandgren. With the top three courts finished, the crowd moved to the bleachers behind courts 4,5 and 6, where the match would be decided. Tennessee's Matt Brewer and Matt Kecki were locked in a seesaw battle that eventually ended with Brewer winning a tiebreaker to earn third set. USC's Peter Lucassen was serving for the match against Matteo Fago at No. 6, leading 6-3, 5-2, but he was broken and needed three more games before giving the Trojans a 3-2 lead. In the other two matches, Brewer was up 3-1 in the third and Nguyen was up 2-0 in the third. Although Smith described Nguyen as a "very nervous kid," there was no sign of that in the second and third sets against Sandgren. Moving beautifully and countering all the pace that Sandgren could throw at him, Nguyen recognized that he had raised his level. "I just started to play more intense, play smarter," said the sophomore. "I just stayed positive. At these moments you just have to stay positive to achieve, so that's what I did." He also got a lot of vocal support from his teammates, who had moved into the bleachers above his court, where they were surrounded by Volunteer fans. Farah decided that a soccer chant was in order and began the ole, ole, ole, ole song that is heard in football stadiums across the world, only with Nguyen's nickname, D-win, inserted after the first four oles. "He's a big soccer fan," Farah said. "I don't know where he got it, he lived in Barcelona, so that's where I think he got it, and I'd been in soccer games in Colombia. I thought it was a great chant for the moment." Nguyen admitted that he heard the chant and it made him laugh, but it was no distraction, as he proceeded to take a 5-0 lead. Meanwhile, Brewer had a match point to make it 3-3 serving at 5-4 in the third, but a missed volley sent the game back to deuce. The quality of tennis in the Sandgren - Nguyen match was extremely high, with the score failing to indicate just how close each point was. 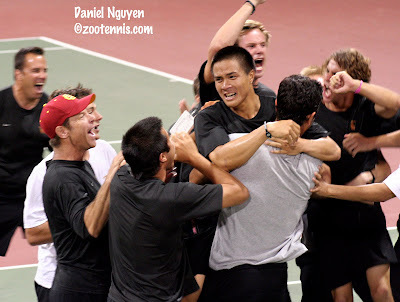 It was Nguyen who won most of them however, and the tournament's most valuable player broke Sandgren in the final game to set off a raucous celebration that included an Gatorade ( which was actually ice water) dowsing of Smith. While the Trojans celebrated national title No. 18, six of which were earned since the 1977 format change, Tennessee coach Sam Winterbotham was left seeking answers. "I think tonight is a great example of me not knowing what to do," Winterbotham said. "The talent we have on this team is fantastic, they came together as a team, they did everything right, and I think they got nervous tonight. I needed to calm those nerves and turn them around, and I don't think I was able to do that." "I think they (USC) played to win, we wanted to win," Winterbotham said. "Maybe we wanted to win a little too much. But I'm proud of what we've accomplished." Smith sensed there would be no stopping his team. "We weren't afraid of the moment," Smith said. "That's the toughest thing to have, to teach, whatever. I don't know if you can teach it. But we weren't going to be afraid out there, that was for sure. And you can see the way the guy finished the match off. Wow." The NCAA individual tournament begins on Wednesday, with Tennessee's Conkic, Williams and Smith and Southern Cal's Farah and Johnson among the 64 men's competitors. In fact, Williams plays Johnson. See ncaa.org for the complete draws. The Stanford Cardinal returned to the top of college tennis Tuesday, claiming a dramatic 4-3 victory over the Florida Gators courtesy of freshman Mallory Burdette. After more than four hours, the championship had come down to the No. 3 singles match between Burdette and Florida senior Marrit Boonstra. Florida's Joanna Mather had kept her team alive at No. 5 singles with a 5-7, 6-4, 6-0 win over a cramping Carolyn McVeigh, focusing all the attention to Court 3, where the score was 4-4. Boonstra held to take a 5-4 lead, using excellent defense to thwart the powerful right-hander from nearby Jackson, Georgia, but something in Burdette's mindset changed at just that moment. "There for a while in the third set I was just so scared of losing," said Burdette, who was named the tournament's Most Outstanding Player. "That's all I could think about. I had to let that go, just play the point at hand. It was tough, I really had to fight my nerves, my stomach was up here in my neck. It was really difficult, but it was great. It hasn't completely hit me yet." Burdette held her serve to make it 5-5, hitting a couple of deft low-volley winners that are difficult when the match is deep in the third set. In the next game she broke Boonstra, who committed a double fault and two unforced errors. With a changeover allowing the tension to build, her teammates gathered at her end of the court, their decibel level rising as Burdette built a 40-0 lead. Burdette needed all three match points, but took the last one, and as she dropped her racquet and turned toward her team, she saw her older sister Lindsay bearing down on her. "I saw her running and I knew I was going to get hit," Mallory said. "I saw everyone behind her, but she was way out in front." "All I was thinking was that I wanted to be the first one to get to her," said Lindsay, who tackled her sister so hard that Stanford football coach Jim Harbaugh complimented her on her form in a congratulatory tweet. "Everybody else went out the gate, but I jumped the fence." One by one the others piled on, a celebration that marked the end of what head coach Lele Forood called a "drought," although the last Cardinal title was just four years ago, in 2006, and they are the all-time leader in championships, with 16. "It's a big drought for us," Forood said. "It feels like the desert, believe me. We haven't had the right combination of factors the last couple of years and we've really been trying to find the formula...We wanted to get back on the map with our program. It's very important for us. We are back now." Lindsay Burdette, a senior who had seen her older sister Erin help win a title for Stanford in Athens in 2005, admitted to being sobered by the team's inability to reach a final during her first three years. "I think I had a little bit better idea of what it took, and all the things that have to go right for that to happen, but I definitely think that Mallory's desire and the idea that we could do this was a little bit stronger." Lindsay had made her own substantial contribution to the eighth-seeded Cardinal's victory over No. 3 Florida, handing Allie Will her first dual match loss of the season 6-3, 6-3 at No. 2 singles, giving Stanford its second point. Stanford had lost the doubles point for the second match in a row, but came out strong in singles, winning five of the first sets. Freshman Stacey Tan drew them even, taking control of her match with Anastasia Revzina after a slow start to post a 6-2, 6-2 victory. Florida freshman Lauren Embree played an outstanding match against Hilary Barte at No. 1, winning 6-4, 6-3 to put the score at 2-2. Veronica Li gave Stanford a 3-2 lead with a 6-3, 7-5 win over Caroline Hitimana at No. 6, but Mather played a flawless third set against McVeigh to ensure Burdette and Boonstra would decide it in that last handful of games. 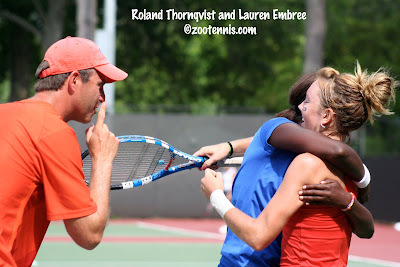 "I really thought our team showed tremendous courage, heart and pride," said Florida head coach Roland Thornqvist. "Even though we came up short, I was really, really proud of our effort and our play. Marrit's been in that situation before and my heart just aches, because she has given everything she has to this program, and it's just not fair that it comes down to something like that. She's going to be hurting for a long time." Despite the disappointing loss, Thornqvist was able to put the loss in perspective. "If you had told me in January that we'd be at 5-all in the third in the deciding match with Marrit on the court, I'll take that and a championship. We did everything we could and should in preparation for this event...an inch here or there decided it today and that inch can't be the end-all, be-all as far as the season is concerned. Once this initial pain here, the shock of losing abates, I'm sure we'll look on this season with great pride." The NCAA individual tournament begins on Wednesday, with Florida's Embree and Will and Stanford's Barte and Mallory Burdette among the 64 women's competitors. See ncaa.org for the complete draws. As is the tradition, the National ITA Awards were announced Tuesday at a luncheon on the University of Georgia campus. The head coach of the year winners are to be announced. The University of Southern California has something the Tennessee Volunteers want--a national title. The Trojans, who have won five NCAA titles since the format change in 1977, and 17 overall, including 2009's, will try to deny Tennessee its first NCAA men's tennis championship on Tuesday evening. The fifth-seeded Trojans defeated top-ranked Virginia 4-2 on the McWhorter courts Monday, while No. 2 Tennessee quieted the home crowd with a 4-1 win over eleventh seed Georgia. USC and Virginia started the action, with the Cavalier and Trojan fans packing the bleachers behind the four main courts. Southern California broke up a close doubles point, winning almost simultaneously at lines 1 and 2. Daniel Nguyen and JT Sundling downed Houston Barrick and Sanam Singh 8-6 at 2, and moments later Robert Farah and Steve Johnson beat Michael Shabaz and Drew Courtney 8-5 to put USC up 1-0. Virginia had managed to overcome the loss of the doubles point in Sunday's quarterfinal win over UCLA but they had difficulty getting much momentum against the Trojans at the start of singles. Farah jumped out to a 6-1 1ead against Shabaz at No. 1, and at No. 6, Peter Lucassen had an early 6-2 lead over Julen Uriguen of Virginia. The Cavaliers did take the first set at No. 2, with Singh leading Johnson; No. 3, with Jarmere Jenkins leading Poldma; and No. 5 with Barrick leading Matt Kecki. But when Courtney dropped a 7-6(9) first set to Nguyen, by far the longest first set of any of the six matches, there was an uneasiness among Virginia fans. That sense of foreboding got worse when at No. 1, Shabaz was unable to convert four set points in a second set tiebreaker and fell to Farah 6-1, 7-6(9), to give Southern Cal a 2-0 lead. Johnson had forced a third set with Singh, and Courtney was down 3-0 in the second set to Nguyen, while Uriguen was down 5-2 in the second to Lucassen. Hope arrived in the form of Barrick, who closed out Kecki 6-2, 7-6(8), but just seconds later, Uriguen finally lost a marathon match game to make it 3-1 USC. After a medical timeout down 0-3, Courtney had fought to get back on serve, and with Jenkins finishing off Jaak Poldma at No. 3 6-3, 7-5 to make it 3-2. Singh and Johnson were early in the third set, so Courtney needed to win his second set to keep Virginia alive. Serving at 4-5, Courtney played a tired-looking game, with unforced errors leading to a 30-40 score. There was to be no celebration by Nguyen after the next point however, as Courtney double faulted to give Nguyen a 7-6(9), 6-4 win. "He had his run, but I just stayed on it, stayed focused," said Nguyen of Courtney's comeback in the second set. "I knew in the last game he was tired, and I was tired as well, so I just fought out there." Although the Tennessee - Georgia match was still in progress, Southern California Coach Peter Smith didn't hesitate in calling Tennessee the "team to beat." "I think they've had the best outdoor season, they've had the toughest schedule and they've really proven themselves," Smith said. "I think they're very, very good, very solid. They got it all-great doubles, great players at the top, great depth. They're playing for a national title and they've never done it. So we'll see." Virginia coach Brian Boland had little to say after his team failed to reach the final for the third straight year, despite entering the tournament as the top seed. "USC played a great match and they were the better team," Boland said, answering in the affirmative when asked if this was the most disappointing of the past three losses. "We left it on the court and are very disappointed." The crowd that turned out for the Bulldogs on Monday did not reach the numbers that attended the Oklahoma match Sunday evening, but it was loud and supportive nonetheless. They had their share of excitement in the doubles point with Tennessee, which saw only one of the three matches fail to reach a tiebreaker. At No. 3 doubles, Edward Jones and Matteo Fago of Tennessee took an 8-5 win from Drake Bernstein and Will Oliver, and with Rhyne Williams and Boris Conkic holding a 6-2 lead over Jamie Hunt and Christian Vitulli at No. 2, the Volunteers seemed poised to chalk up a quick point. But Hunt and Vitulli won six of the next seven games, giving Vitulli an opportunity to serve out the match. He was broken however, on a double fault at 30-40, to send it to a tiebreaker. Court 1 was already in one, and Georgia's Javier Garrapiz and Nate Schnugg had saved two match points down 4-6 in their tiebreaker with JP Smith and Davey Sandgren. On the second of those, Smith double faulted and two points later Georgia had the win 9-8(6). On court two, all the crowd's support was now directed toward Hunt and Vitulli, but it was the Tennessee team that played cleaner tennis, making few errors, even during the net exchanges. Williams and Conkic took a 6-2 lead and Williams served it out. "It just showed the character of Rhyne and Boris," said Tennessee coach Sam Winterbotham. "When you're at court level, hearing that energy coming from the Georgia fans, it just shows how committed those guys were to what we set out to do, and they played a great tiebreak to win it." In the singles, Winterbotham chose to remove Matt Brewer from the lineup, which moved Fago up to 5 and moved Davey Sandgren into the 6 spot. It paid off quickly, as Sandgren earned the Vols second point with a 6-4, 6-3 win over Will Reynolds. Georgia had hope however, with Schnugg earning a split with Conkic at No. 2, Garrapiz leading Smith at No. 1, and Bernstein coming back from a 6-0 first-set loss to Tennys Sandgren at No. 4 to even that match. Garrapiz, celebrating his birthday today, gave Georgia its lone point with a 7-5, 6-4 victory over Smith, but shortly thereafter, Fago defeated Vitulli 7-5, 6-3 to make it 3-1. On Court 3, Williams and Hunt were locked in a tight struggle, and Williams was particularly a target of the Bulldog fans, who even began counting up the seconds he was taking between points. Williams failed to respond in the way they were hoping though, taking the tiebreak 7-6(8) in the first set, and jumping out to a 5-0 lead in the second. While Williams was serving for the match at 3, Tennys Sandgren had a 15-40 lead at 4-5 in the third set, with Bernstein serving. Sandgren didn't get the first match point, but did get the second, giving the Sandgren siblings the same number of points for the day as Stanford's Burdette sisters. 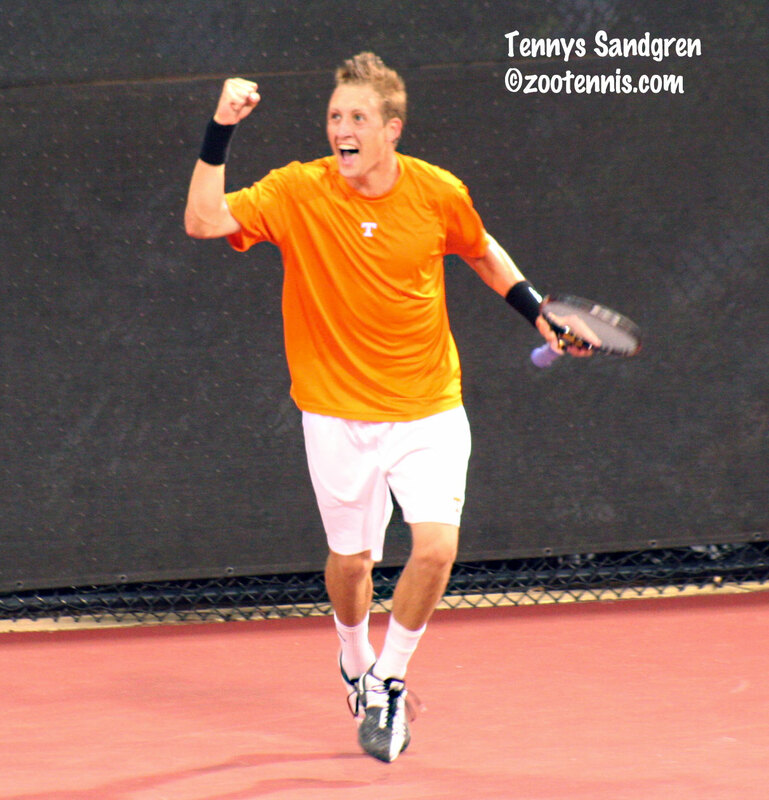 With his 6-0, 4-6, 6-4 win, Sandgren had helped put Tennesse in its first final since 2001. "We both got off to fast starts, Davey was up 3-0, I was up 3-0, Matteo was up 3-0--we were doing pretty well in the bottom," Tennys said. "It's great to play with him so close and for both of us to come up with W's, it's awesome." Although Georgia wasn't able to duplicate the national title it won the last time the NCAAs were held in Athens, coach Manny Diaz was pleased with the run his team made this year. Reluctant to call them overachievers, Diaz said putting that label on the team wouldn't be giving his players enough credit. "Tennessee is a great team. We've come a long ways, especially in the last two, three weeks...," Diaz said. "We put in the work, these guys really dedicated themselves, really trained hard, really focused, and we knew we were going to have a good NCAA tournament." Looking ahead to the final, Winterbotham downplayed the implications of playing for Tennessee's first national title. "This is going to sound funny and you may not believe me but, it's the next match," Winterbotham said. "We'll have plenty of opportunities to sit back and look at our accomplishments this year, and I'll promise you we'll do that, but we're preparing ourselves for the next one. We've done that all year, and we're going to continue to do that." As for USC, Winterbotham has great respect for the team across the nets Tuesday evening. "They're the returning NCAA champions, with nearly everybody back...it does not surprise me one bit that they're here." The men's team final will be aired on ESPNU at 6 p.m. EDT Tuesday. 3. Peter Lucassen/Jaak Poldma (SOUTHERN CALIFORNIA) vs. Lee Singer/Jarmere Jenkins (VIRGINIA), 5-5, unf. 2. #3 Steve Johnson (SOUTHERN CALIFORNIA) vs. #14 Sanam Singh (VIRGINIA), 4-6, 6-4, 1-2, unf. 2. #75 Nate Schnugg (GEORGIA) vs. #36 Boris Conkic (TENNESSEE), 2-6, 6-0, 4-3, unf. 3. Jamie Hunt (GEORGIA) vs. #45 Rhyne Williams (TENNESSEE), 6-7 (8-10), 0-5, unf. Stanford and Florida last met for the NCAA title back in 2003, with the Gators denying the Cardinal a third straight title with a 4-3 victory in Gainesville. On Tuesday afternoon, the two powerhouses of women's tennis will square off again after Stanford took a 4-1 win from Notre Dame and Florida got past North Carolina 4-0 at the Dan Magill Tennis Complex. Playing on the McWhorter courts due to the scheduling of the Georgia men, No. 3 Florida and No. 2 North Carolina started first on the partly cloudy and warm afternoon. Florida, who has yet to lose a match outdoors this year, breezed at No. 3 doubles, with Caroline Hitimana and Anastasia Revzina taking out Jelena Durisic and Jocelyn Ffriend 8-1. Ahead on the other two courts, Florida kept its advantage, capturing the doubles point when Lauren Embree and Joanna Mather defeated Katrina Tsang and Shinann Featherston 8-4. Florida won four first sets in the singles, but Carolina fought back to force third sets in two of those matches, and on Court 6, Claire Bartlett of Florida and Zoe De Bruycker were in a lengthy first set battle. The top of the lineup, which has been the Gators strength thoughout the season, continued to perform well, with senior Marrit Boonstra getting the second point with a 6-2, 6-2 win over Sophie Grabinski, and freshman Allie Will earning point number 3 with a 6-3, 6-3 victory over the Tar Heels Katrina Tsang at No. 2. At No. 1 however, Embree had lost the second set to Marand 6-1 after taking the first 6-2. Shinann Featherston had forced a third set at No. 5 against Florida's Joanna Mather, and De Bruycker had taken the opening set at No. 6. At No. 4, Gina Suarez-Malaguti, known as "Peaches" to all the Tar Heel fans cheering her on, had won the first set from Revzina. So despite the 3-0 lead, the match was far from over. Embree and Marand traded breaks in the first four games of the third set, before Embree finally held for 3-2. Both women settled down after that, with the left-handed Marand serving well and hitting her ground strokes exceptionally deep. Embree stayed in front, and with Marand serving at 4-5, the senior from Texas was down 0-30 before taking the next four points. The one area of Marand's game that wasn't sharp was her overhead, and Embree did her best to make Marand hit as many of them as possible. With Marand serving at 5-6, Embree hit a perfect passing shot to make it 15-30 and when Marand's forehand went long on the next shot, Embree had two match points. Again Marand approached the net, and Embree lofted a perfect lob that took a moment to drop well inside the baseline, with Embree screaming with joy before it landed. "I didn't look to see it hit," said the 19-year-old Embree, who a year ago at this time was playing in the main draw at the French Open. "I knew it was going in. I was relieved, I wasn't nervous anymore. I was so excited, so many different emotions." Florida head coach Roland Thornqvist, seeking his second NCAA title after winning his first in 2003, believes his two freshmen have been the key to the Gators' run. "Once again, our two freshman up top keep proving time and time again that they're not what you'd call traditional freshmen. They're very mature in their play, they're very mature in how they compete and this scenario here is not overwhelming to them." "We knew North Carolina was going to be very, very tough and they were. We're proud of how we faced and conquered that challenge." North Carolina head coach Brian Kalbas, who led his team to the school's first-ever Final Four appearance this year, saw more than just talent from Florida in Monday's match. "I give a lot of credit to Florida. They played an amazing match in doubles and singles," Kalbas said. "They're a very talented team, but they play with a lot of toughness. They made us play one extra ball every point and it made things difficult." While Florida was fighting off the charge of North Carolina, No. 5 Notre Dame and No. 8 Stanford were beginning play on the Henry Feild courts. After splitting the No. 2 and No. 3 doubles matches, the point would come down to Court 1, where Kristy Frilling and Kali Krisik of Notre Dame and Hilary Barte and Lindsay Burdette were at 6-6. The Stanford team was broken and Frilling served it out to give Notre Dame a 1-0 lead. After losing the doubles point for only the second time this year, Stanford came out determined to make a statement in singles, and it was the Burdette sisters who took the lead. Senior Lindsay, playing Shannon Mathews at No. 2, and freshman Mallory, facing Chrissie McGaffigan at No. 3, dominated from the outset, and Notre Dame head coach Jay Louderback was impressed. "The Burdette sisters--I was worried someone was going to get hurt," Louderback said, tongue-in-cheek. "I don't know that I've seen two players hit the ball that big outdoors that consistently. We did everything we could and we didn't have a chance. I felt they were the difference today. They played so well." Mallory won 6-0, 6-1 to tie it at 1-1, and Lindsay followed with the Cardinal's second point 6-1, 6-2. Freshman Stacy Tan made it 3-1 with a 6-2, 6-4 win over Cosmina Ciobanu at No. 4, and it was junior Hilary Barte, who clinched Stanford's quarterfinal win over top-seeded Baylor on Saturday, who had the honors again. 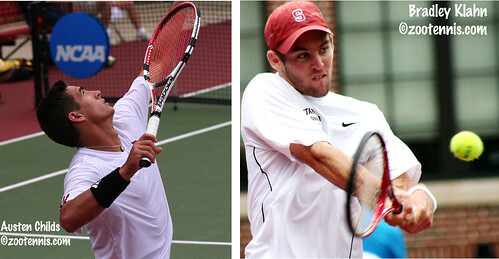 Barte defeated Frilling 6-4, 6-4 to put the Cardinal in their first final since winning the title in Palo Alto in 2006. "We're really thrilled to be sitting at this table again," said Stanford head coach Lele Forood of the post-match press conference. "It's been a few years for us, but we're delighted to be here. We had some great performances today, and the whole top of our lineup was outstanding." For Lindsay Burdette, who hails from nearby Jackson, Georgia, Athens is a special place. She came to the Dan Magill Tennis Complex to watch her sister Erin win the title with the Cardinal in 2005, and remembers the trophy pictures and excitement of the title. "I thought this was how it was every year," said Burdette, who will be playing in her first final on Tuesday. "It takes a lot of effort on the part of a lot of different people to make all this happen every year. We've put in 110%, from the coaches, to other people, supporters of the team, to the team members. It's been a lot of effort, but all worth it." The women's final between Florida and Stanford will be broadcast on ESPNU at 2 p.m. on Tuesday. 1. #5 Marrit Boonstra/Allie Will (FLORIDA) vs. #13 Sanaz Marand/Sophie Grabinski (NORTH CAROLINA), 6-3, unf. 4. #102 Anastasia Revzina (FLORIDA) vs. Gina Suarez-Malaguti (NORTH CAROLINA), 4-6, 6-4, 3-3, unf. 5. Joanna Mather (FLORIDA) vs. Shinann Featherston (NORTH CAROLINA), 6-2, 3-6, 4-3, unf. 6. Claire Bartlett (FLORIDA) vs. Zoe De Bruycker (NORTH CAROLINA), 5-7, 2-2, unf. 5. Kali Krisik (NOTRE DAME) vs. Carolyn McVeigh (STANFORD) 6-4, 2-3, unf. 6. Kristen Rafael (NOTRE DAME) vs. Veronica Li (STANFORD) 6-7 (4-7), 2-2, unf.